The poster features a drawing of the Manzanar cemetery Ireito monument (“Soul Consoling Tower”). 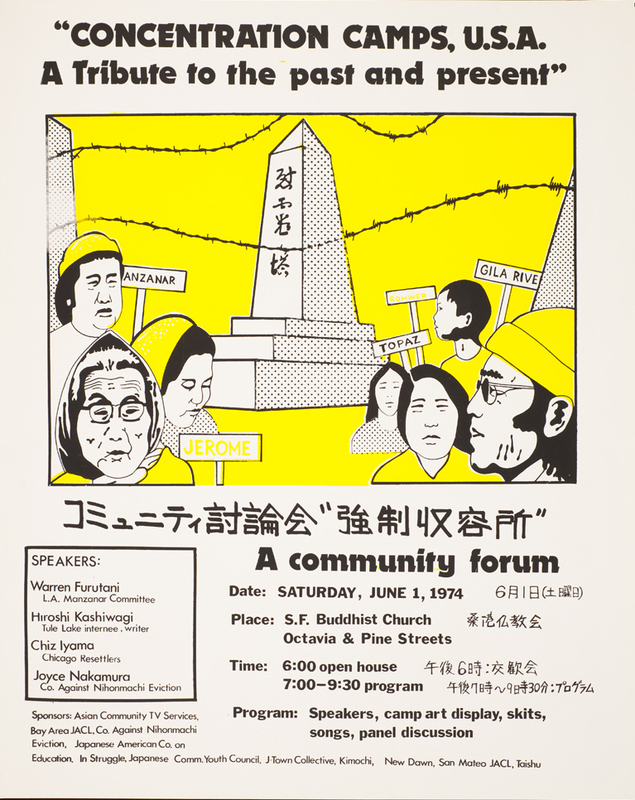 The text reads: "'Concentration Camps, U.S.A. A Tribute to the past and present’: A community forum, Date: Saturday, June 1, 1974, Place: S.F. Buddhist Church, Octavia Hiroshi Kashiwagi, Tule Lake internee, writer; Chiz Iyama, Chicago Resettlers; Joyce Nakamura, Co. Against Nihonmachi Eviction; Sponsors: Asian Community TV Services, Bay Area JACL, Co. Against Nihonmachi Eviction, Japanese American Co. on Education, In Struggle, Japanese Comm. Youth Council, J-Town Collective, Kimochi, New Dawn, San Mateo JACL, Taishu." “Concentration camps, U.S.A.; A tribute to the past and present,” Digital Public Library of America, http://dp.la/item/5e69c6ad2587cb34e263cbffada01396. Courtesy of University of California Santa Barbara, Special Collections via California Digital Library.